Salmorejo is a cold, creamy tomato soup, originating in Córdoba, Spain. It is a simple pink-orange, summer soup made with tomatoes, bread, oil, garlic, and vinegar, similar to gazpacho. Then, it is garnished with diced Spanish Serrano ham and hard-boiled eggs. Hard boil the eggs. Place in ice cold water to cool. Refrigerate until ready to serve. Cut off the hard crust from the baguette, then cut into slices approximately 1/2-inch thick. Pour about a 1/4-inch water into a large glass baking dish. Add bread slices and allow bread to soak for 30 minutes. Squeeze excess water out of slices and place in a blender or food processor. Peel and mince garlic and place in food processor. Peel tomatoes and remove seeds. Add to the food processor and pour in the vinegar. Process. Slowly pour in oil while processing. Continue to process until smooth. If the mixture is too thick, pour in a bit of cold water while processing. When ready to serve, dice Serrano ham and peel and quarter hard boiled eggs. 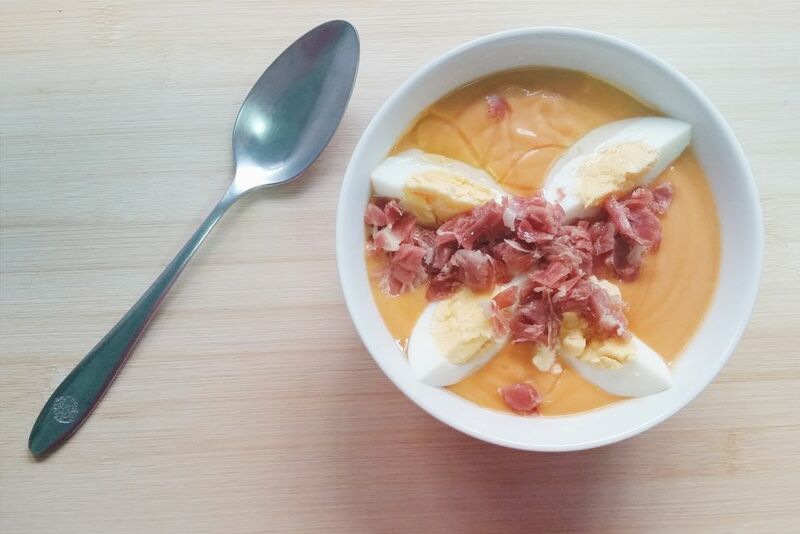 Pour soup into bowl, and sprinkle pieces of ham and place hard-boiled egg pieces in each bowl. Drizzle olive oil over soup before serving, if desired.